Your visit is an important part of the admission process because it gives you an authentic feel for life on campus. 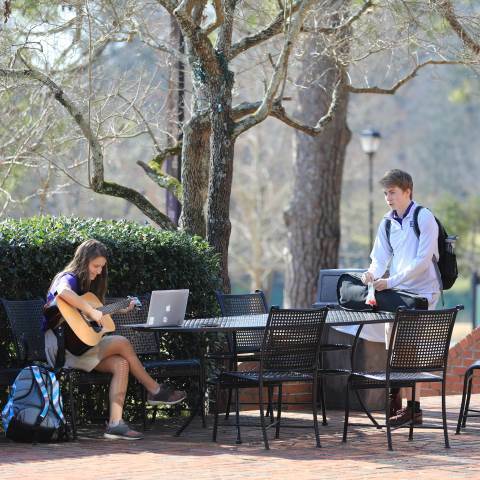 You'll visit classes, meet new friends, and have the opportunity to truly see yourself at Darlington. Should you choose to join the students from around the state, the country and the world who enroll here each year, we are certain you will find no community more welcoming than ours to call your "home away from home." Private visits, available most Mondays through Fridays, are customized based on your age, interests and Darlington’s class schedule. Your visit may include a campus tour; shadowing a student; lunch; and time with students, faculty and staff, and the admission team. Prospective boarding students will also stay overnight in the dorms. No two tigers have the same stripes, so come discover your stripes at one of our Discover Darlington experiences! Families that attend our open houses will experience campus life, including a tour, class time, a panel discussion with current students and/or faculty, and time with the admission staff. Prospective boarding students will also stay overnight in the dorms. Darlington’s 500-acre campus is nestled around a small lake in the foothills of the Lookout Mountain Range in Rome, Ga., a medical center and college town located approximately one hour northwest of Atlanta. Converted from a scenic park to a school in the early 1900s, our campus is one of the most beautiful sites in Northwest Georgia, with plenty of breathtaking beauty, timeless architecture and six miles of wooded trails to enjoy. Do as the Romans do! Just minutes from Darlington, along the river, you'll find Historic Downtown Rome, which features locally owned restaurants, boutique shops, hotels and trails. Rome is also home to Berry College, the largest college campus in the United States. Stretching across 27,000 acres, Berry welcomes visitors to explore the campus by driving or even hiking.